Christian Stevenson is a man of many talents. Whether he’s dj-ing at Bill Gates’ latest Microsoft party or acting in feature films, Christian is not easily pinned down. Christian is probably best known and respected as the presenter of his Channel 5 television series ‘RAD’ and ‘RAD The Groms Tour’ which ran for 10 years and won him and the channel their first BAFTA in the Best Entertainment category. The Bafta currently takes pride of place in Christian’s downstairs loo! More recently however, Christian’s love and knowledge as a BBQ cook extraordinaire has come to the fore. From an early age Christian has been obsessed with cooking, predominantly cooking with live fire. Christian grew up in the American South and since childhood he has immersed himself in this hugely underrated form of cooking, educating himself in the traditional artisan techniques of the Deep South and adding his own very individual take on various recipes. 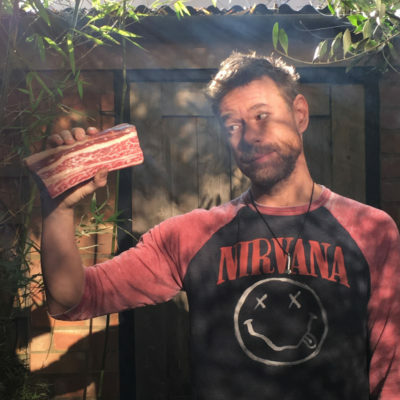 His alter ego DJ BBQ has been cooking up a storm and has now caught the eye of Jamie Oliver who has swiftly signed Christian up to present on his new FoodTube television channel.